Well, before I take a look at the recent Scott Rolen trade, I thought it might be helpful to take a look at the Reds performance in the draft. One of the obvious trends that has emerged in baseball over the past few years is organizations valuing prospects more and more. The main reason is just how cost effective it can be. As free agent salaries continue to escalate, the low cost of homegrown talent in the first six years of their careers becomes more and more valuable. In addition, the low cost of young talent makes it easier to replace them if they get injured. If you are relying on a $15M player and he gets hurt, then there is less flexibility to replace him. On the other hand, if you are relying on a young player who is making less money, then he is easier to replace because of the original cost savings. Obviously, there are benefits to young talent, however it bears mentioning that young talent is high risk and often times simply doesn't pan out. So, there are times when trading away prospects is a good idea, especially when it becomes so valued around baseball that it risks becoming overvalued. You have to follow the value, whether that means keeping prospects or trading them away. Below is a spreadsheet that examines the Reds performance in the draft since 1985, which was the year Marge Schott took over and Barry Larkin was drafted. I only included up to 2004, as the draft classes after that still include prospects who can make the show. The 2004 class could still have a few prospects who will make the show, but 2004 seemed a good cutoff date. Also, I highlighted from 1985 through 1998 because that was the Marge Schott era and I wanted to see how her scorched earth policy in regard to scouting and player development impacted the Reds drafts. It's difficult to draw any significant conclusions from the data, but obviously the Reds have had very little success in acquiring impact talent in the draft during this period and have had some stunningly bad drafts in general. The spreadsheet includes the year, the number of picks made by the Reds, the number of players from the draft class who have made the majors (though, not necessarily with the Reds), the success rate, and the big names from the draft class. It's difficult to imagine a worse draft in history than the 2001 draft, as the Reds didn't have a single player make the majors. Jeremy Sowers made it, but he never signed with the Reds and made the majors with the Indians. The 2000 draft class was almost as bad and 2002 would be a disaster if not for the emergence of Joey Votto. 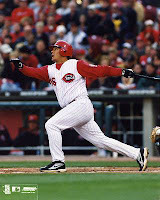 Even in the best years, the Reds only had a handful of players make the majors. And, the true impact players only come along once every few years...at best. So, while it's great to develop homegrown talent, it's also important to keep the high flame-out risk rooted firmly in mind. Not every player in the system is destined for greatness and sometimes it makes sense to use them to acquire the veteran talent. Ultimately, the purpose of an organization's farm system is to support the MLB team. However, there are different ways for an organization to make the best use of the farm system. A good contrast of styles is the Oakland A's and the SF Giants. Over the years, the A's have typically focused on developing homegrown talent, while the Giants have frequently traded away young prospects for established veteran talent. While the philosophies differ, each has resulted in a great deal of success for the organizations at the MLB level. There are times when it is in the best interests of the organization to try to develop homegrown talent despite the risk that they won't pan out. At other times, it is in the best interests of the organization to trade away prospects, paying the higher price for the reduced risk provided by veterans. Fortunately, the Reds have made some strides in improving the farm system, which is a must for the success of the small to mid market team. Homegrown talent is vital to MLB success, but that talent can be utilized in a variety of ways. Well, according to Travis Wood's parents via the Bryant Daily, Travis Wood will be starting Saturday night for Louisville. The Reds have become very conservative in their player development, promoting prospects only when they almost have no other choice. Wood has been so dominant at double-A that he is certainly ready for a new challenge. LOUISVILLE, Ky. — Bryant's Travis Wood has been promoted to the Cincinnati Reds' Class AAA affiliate, the Louisville Bats of the International League, amidst a dominating season for the Class AA Carolina Mudcats. According to Wood's parents Jay and Dena Wood, he will make his AAA debut at Syracuse on Saturday at 7 p.m. The lefty was told last week would be his last at Carolina but made one more start before the promotion. Class AAA is one notch below the Major Leagues. A Bryant High School graduate and former Hornet and Bryant Black Sox star, Wood was selected by the Reds in the June 2005 draft. This season, he's posted a 9-3 record with a 1.21 earned run average in 19 starts, covering 119 innings. He's allowed just 78 hits and 37 walks while striking out 103. Opponents are hitting just .189 against him. He was also the starting pitcher for the North All-Stars in the Southern League All-Star game in Birmingham, Ala., recently. In leading the league in ERA, the next lowest mark is 2.70. His nine wins in consecutive decisions set a new Mudcats franchise record. Nine wins is tied for most in the league. His strikeout mark is tops in the league and his innings pitched is tied for most. He also has the league's best WHIP (Walks + hits per innings pitched) at 0.97. At Louisville, Wood joins a team that leads the Western Division of the International League by 9 1/2 games. With the 43rd overall pick in the 2009 draft, the C incinnati Reds selected University of Southern California pitcher Brad Boxberger. Boxberger was a draft eligible junior who is listed at 6-2 and 200 lbs, but likely stands closer to 6-0. He both bats right and throws right. He joins Mike Leake to give the Reds a one-two punch of polished college pitching prospects in their first two picks. Boxberger certainly has the bloodlines for success, as his father Rod went 12-1 with a 2.00 ERA and earned College World Series MVP award for the 1978 national championship USC team. Brad was drafted out of high school by the Royals in the 20th round of the 2006 draft, but he chose instead to follow in his father's footsteps by attending USC. Boxberger jumped right into the starting rotation as a freshman and quickly proved that he belonged. 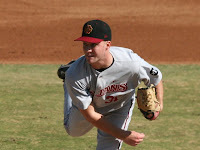 He started 14 games and worked in 90.0 innings posting a 3.20 ERA with a 72/34 K/BB ratio in a tough Pac-10 conference. His performance was so strong that he took over the Friday night starter duties for the Trojans. His sophomore season didn't go quite as well, as he split time between the rotation and the bullpen. Over 18 total games and 9 starts, Boxberger posted a 6.12 ERA in 50.0 innings with a 52/26 K/BB ratio. He missed roughly 3 weeks due to elbow soreness and ultimately ended the season as the team's closer. During his junior season, Boxberger showed no lingering effects of his elbow injury. He went back to starting fulltime, making 14 starts and tossing 94.0 innings. He posted a 3.16 ERA with a 99/50 K/BB ratio. His performance was strong enough to earn him All-Pac-10 honors and reestablish his MLB prospect status. Boxberger works with three solid pitches that have plus potential. He throws a 91-93 mph fastball with good movement that touches 94 on occasion, a 78-80 mph curveball, and a circle changeup that has good late sink to it. He needs to demonstrate more consistency with his pitches, especially his offspeed offerings. His overall command also needs improvement, as it tends to come and go. But, he has a good feel for pitching, which should help his development. On the mound, Boxberger uses fairly conventional mechanics. To start his delivery, he moves his left foot forward and rotates his right foot on the rubber. He then brings his left leg up into his leg kick, which includes significant hip rotation. In fact, his leg kick includes so much hip rotation that he almost points his knee at the second base and shows his back to the hitters. It's not quite that extreme, but it's certainly heading in that direction. He keeps his hands up near his chin until after his leg kick and he breaks his hands. He has a good arm swing and keeps his elbow in good relation to his shoulder. His lower body drive off the mound isn't strong and his stride is rather short, which leaves him with a very upright delivery and follow through. Ultimately, his lack of a strong push off the mound prevents him from utilizing his body as effectively as he could, which is somewhat surprising because of the significant hip rotation that he uses. Boxberger isn't very tall, so he doesn't have the advantage of pitching on a downward plane. In addition, he doesn't come completely over the top, but rather utilizes a high three-quarter arm slot with a free-and-easy arm action. In fact, his arm action is so loose that at times it looks like he slings the ball to the plate, which could help explain his inconsistency. Overall, his pitching mechanics are fairly clean and there aren't any significant red flags, but he could do a better job of throwing with his body to minimize stress on the arm. The fact that he suffered from an elbow injury in college isn't a great sign, but it wasn't serious and he doesn't seem to be suffering from any lingering effects. Boxberger is an intriguing prospect, but I'm not entirely sure what we have yet. Prior to his strong junior season, many scouts projected him as more of a reliever, but his performance last year changed some minds. Part of me looks at Boxberger and sees a new version of Sam LeCure. A good, polished college pitcher whose game ultimately didn't translate very well to the professional ranks. However, Boxberger undeniably has better stuff and if things break right in his development he has the chance for two or three plus pitches. At the very least, he has a couple ticks in velocity on LeCure, which can only help his chances. It'll be interesting to see how Boxberger's game translates to the professional ranks, but he certainly adds another interesting arm to a Reds farm system in need of them. Boxberger and Mike Leake should add quality and depth to the list of pitching prospects in the system. 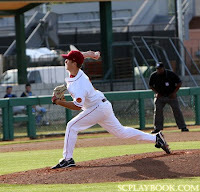 **Josh Fellhauer signed a contract, under went a physical, and was assigned to the Dayton Dragons on July 3rd. Manager Todd Benzinger started him tonight in centerfield and the leadoff slot. He went 0-4 with no walks or whiffs. I was curious to see what type of defensive role the Reds envisioned for Fellhauer and it didn't take long to find out. If he can stick in center, then his value will increase. **Dragon pitching prospect Josh Ravin is currently on the disabled list, and likely will remain there for another week, with a strained pitching elbow. Hopefully, he comes back healthy and ready to build on his solid 2009 season. His first half performance for Dayton has helped him regain his prospect status. His control still needs work, but it has been much improved in the 2009 campaign. **The Reds signed former University of North Carolina catcher and 4th round draft pick Mark Fleury to a contract and assigned him to the rookie Pioneer League. He made his debut for the Billings Mustangs on July 3rd. Originally I thought they'd start him out in low-A ball, but the Reds' conservative player development strategy continues and he starts out his career in the rookie league. **Billy Hamilton is off to a "quick" start, to say the least, in the Gulf Coast League. In his first 9 games, Hamilton has already swiped 7 bases without being caught once. He joins Theodis Bowe to give the Reds some serious speed in the Gulf Coast League. It's been a few weeks since the draft and I'm about ready to turn the page, but since I haven't read or heard much coverage about the Reds' 7th Round draft pick, I thought I'd take a quick look at Josh Fellhauer. Fellhauer was drafted out of Cal State Fullerton with the 209th overall pick. He stands 5-11, tips the scales at 180 lbs, bats left, and throws left. Fellhauer first caught my eye at the College World Series this year. Or, perhaps more accurately, his swing caught my eye. He's got a smooth lefthanded stroke that should play well in the professional ranks. In 2009, as a junior Fellhauer had his best season to date. He flashed an intriguing, well rounded offensive game against top collegiate competition. On the season, he hit .396/.480/.529 with 6 homers, 18 stolen bases, and a 26/26 K/BB ratio. Obviously, there are some significant positives, but a few red flags as well. His 18 stolen bases come with 13 caught stealings. And, as impressive as his isolated on base percentage is, it was achieved in part by 16 hit by pitches. Now, there is nothing inherently wrong with using the hit by pitch as an offensive weapon (Craig Biggio used it to great effect), but it remains to be seen whether it will continue to be a weapon at the professional ranks. It's one thing to leave your elbow out over the plate against a collegiate curveball, but it's something else entirely to do it against a big league fastball. At the plate, Fellhauer uses a quiet approach. His stance is slightly o pen and a bit wider than shoulder width. He uses a very small stride to trigger the weight transfer and close up his stance. He maintains good balance and exhibits good body control throughout the swing. His hand position starts in front of his left shoulder and he brings them back into hitting position as the pitcher gets ready to deliver the ball. As his weight transfers, Fellhauer uses good hip rotation to clear them out of the way and generate bat speed. He keeps his head down on the ball and uses a compact, line drive swing that allows him to center the ball on the barrel of the bat. On his follow through, he keeps both hands on the bat, which arguably limits his extension, but increases his control and stability throughout the swing. Overall, Fellhauer has a nice, compact swing and maintains good balance and body control throughout. If you want to take a look at his swing, then check out this scouting video from MLB.com. On the defensive side, Fellhauer has a solid arm and runs well. During his time at Fullerton and for Team USA, Fellhauer has spent time at all three outfield positions. Obviously, the versatility is a good thing, but it also may indicate that his range is a bit stretched in center. It'll be interesting to see how the Reds use him once he signs. Fellhauer is an interesting prospect. He lasted until round 7 because he lacks plus tools and his frame doesn't allow for a great deal of projection, but he has a nice, well rounded game and he certainly knows how to hit. He strikes me as the kind of player whose overall game is greater than the sum of the individual parts. His prospect status will likely be driven by his defensive position. If he can handle centerfield, then his bat will be less critical. In addition, he projects as more of a table setter than a run producer, so his game would profile better in centerfield than it would in a corner spot. Overall, I like his swing and his approach at the plate, which could be his ticket to the majors. Things would have to break right for him emerge as an everyday MLB player, but a smooth, line drive swing is certainly a nice place to start.